Ahhh yes, another Malbec to review. This time, it's the 2010 Vintage Espuela del Gaucho Malbec, which is of course, out of the Mendoza Province of Argentina. The Malbecs coming out of Argentina have continued surging in popularity, despite the recent trend of people shifting toward drinking sweet red and pink wines. I think the allure of the Argentinian Malbecs are the value. The middle shelf Malbecs are running only $8-15 a bottle, which makes many of them a great bargain. But, I digress. So, what's a gaucho? Well, it's essentially a term used for the South American equivalent of a cowboy, or cattleman, something which is a big part of the Argentinian culture. I assume the winemakers were trying to capture some of that lifestyle and vibe into this wine. When I got this bottle, I expected a rustic, dark berried wine... and that's exactly what I got. 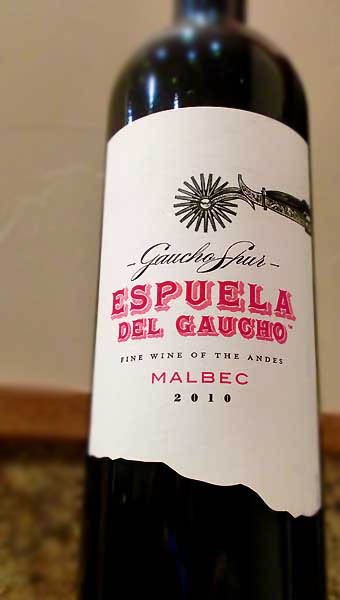 The 2010 Espuela del Gaucho Malbec pours a deep plum purple. It has aromas of black raspberries with some nondescript spice and a bit of oak. It initially tastes of juicy plums and raspberries, with some Christmas-type spice, followed by a fairly strong bit of toasted oak and earthiness (think cumin). This is juicy, yet spicy, yet pretty damn earthy. All in all, it's what I enjoy in a Malbec, a fruit-forward, earthy, rustic red wine. Granted, I could see this being a very polarizing wine for many people. This isn't a silky smooth, refined French wine. This is rustic and raw Argentinian Malbec. Drink This: if you want a rustic, earthy taste of Malbec. This isn't my favorite Malbec, or even in my top 5, but it's good and pretty characteristic of what I think a Malbec from South America should be. I'd buy it again. Don't Drink This: if you're looking for a refined, balanced red wine, this will just turn you off.